Plaintiff's "allegation that if [plaintiff] cease[d] making royalty payments under [a license agreement], ' [defendant] would bring suit against [plaintiff] for infringement and injunctive relief” was sufficient to create a substantial controversy at the pleading stage even though defendant "advised [the declaratory judgment plaintiff] in writing that [defendant] did not 'presently intend' to terminate [a license agreement]." Defendant's motion for a finding of exceptional case and an award of attorneys' fees was denied. "Within days of receiving the Court’s priority date ruling, plaintiff offered a 'walk-away' settlement pursuant to which plaintiff would abandon his infringement claim and defendants would drop their invalidity cross-claim. . . . When defendants rejected plaintiff’s settlement offer and pursued their cross-claim of invalidity, plaintiff felt compelled to defend his patent. 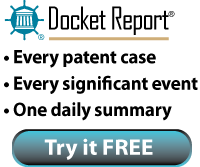 While the experimental use argument plaintiff raised in opposition to defendants’ motion [for summary judgment] was not well-supported, plaintiff had done what he could to avoid further litigation and expense, and it was not unreasonable for him to try to deflect a direct assault on his patent when defendants opted to continue the litigation." Deposition of Prosecuting Attorney and Former Trial Counsel "Not only Relevant, but Possibly Crucial, to an Inequitable Conduct Defense"
Plaintiff's motion to quash the depositions of its prosecuting attorneys was denied. "Multiple jurisdictions recognize that mental impressions of prosecuting patent attorneys are not only relevant, but possibly crucial, to an inequitable conduct defense. In this case, the subpoenas only request that the prosecuting attorneys produce certain documents and appear at depositions, without indicating the specific questions [defendant] intends to ask. As such, it is unreasonable to conclude that everything these individuals could say that is relevant to the litigation would be privileged information." In denying defendant's motion for judgment as a matter of law, the court rejected defendant's argument that plaintiff did not meet the Panduit test for lost profits. "[Defendant] asserts that [plaintiff] was required to put forth affirmative evidence as to each sale, including the identity of each customer. The law does not require such precision, however. To be entitled to lost profits damages, the patent owner 'need not negate all possibilities that a purchaser might have bought a different product or might have foregone the purchase altogether.' The relevant standard is whether the patent owner demonstrates a 'reasonable probability that the sale would have been made but for the infringement.' "
Plaintiff's renewed motion for a preliminary injunction precluding defendant "from launching in the United States its generic raloxifene product" was granted where defendant conceded infringement but contested validity and enforceability. Defendant "failed to raise a 'substantial question' of invalidity on the basis of obviousness" in part because "[the prior art references] were all considered by the PTO during prosecution." Likewise, defendant's "efforts to raise a substantial question as to enablement have fallen short" and defendant's evidence of inequitable conduct provided an "insufficient basis to satisfy the threshold requirement for establishing . . . deceptive intent." In denying defendants' motion for a stay pending reexamination, the court rejected the argument that plaintiff would not be prejudiced because it was a non-practicing entity. "[Plaintiff] may still be entitled to a permanent injunction, even though it does not practice its patent. While [plaintiff] will be able to collect damages for infringement occurring during the stay, [plaintiff] may still suffer from irreparable harm during that time. Should [defendant] be found to infringe the asserted patent in this litigation, damages alone may not fully compensate [plaintiff] for a lengthy delay resulting from reexamination. The right to exclude even for a non-practicing entity, may be the only way to fully vindicate the patentee’s ownership in the patent." Defendant granted plaintiff an implied license to its patent where, during the course of a six year business relationship, defendant "led [plaintiff] to build infringing products, marketed [plaintiff's infringing products] to third parties, sold [plaintiff's] infringing products, and despite [defendant's] knowledge, involvement, and power to restrict the practice, [plaintiff] sold products to third parties." Defendants were entitled to summary judgment on plaintiff's damages theory that sales of ink and toner were convoyed with sales of defendants' accused multi-function (print, scan, fax, copy) machines and therefore should be included in the reasonable royalty calculation. The patent-in-suit claimed an "information station" or "switching device" that "converts paper documents into digital images, stores those digital images, retrieves them on command, and prints them on command." The court explained: "Plaintiffs have not shown that the toner and ink cartridges are more than merely consumable supplies. Plaintiffs have not shown that they would have sold the ancillary or collateral convoyed products with their [asserted] patent. Plaintiffs never manufactured their patent nor offered to sell their patent. Plaintiffs cannot show that they would have anticipated the sale of the toner and ink cartridges but for the alleged infringement of the [asserted] patent by [defendants]." Defendants' motion to stay pending reexamination was denied. "[I]t is this Court’s experience that the reexamination process may actually complicate a case by creating additional prosecution history estoppel and disavowal arguments that must be addressed during claim construction. To convince this Court that a stay will actually simplify a case, the requesting party must do more than merely proffer oft-cited reexamination statistics and generic judicial efficiency arguments. This Defendants have not done." Defendant's motion to stay pending reexamination was denied where "it is at least likely that [plaintiff] and [defendant] are direct competitors," and plaintiff sought "both a preliminary and permanent injunction." "[Plaintiff] has only recently released [its product]. This weighs against a stay given that this is likely a critical juncture in developing the market for [the product]. If the Court were to grant the stay and prevent [plaintiff] from seeking injunctive relief, [plaintiff] could potentially lose many customers to [defendant] and consequently lose significant ground in the market in the coming years. This type of market loss is difficult to measure in monetary damages." Plaintiff's motion for a protective order regarding a subpoena served on its expert was granted in part. Defendant's expert was permitted to use plaintiff's expert's own freezer to recreate plaintiff's testing conditions so long as the expert has seven days' notice to provide the freezer. In awarding a post-verdict ongoing royalty of 5.1%, the court rejected the infringing party's contention, and the conclusion of three Eastern District of Texas cases, "that the jury’s finding of liability did not affect the applicability of the Georgia-Pacific factors. . . . [T]he Court concludes that it must assume that the jury finding of liability in this case would have strengthened [the patentee's] bargaining position had the parties negotiated a license after the jury verdict. This strengthened bargaining position would have resulted from the parties’ knowledge that [the patentee] could have forced [the] infringing product off the market for a limited period of time (creating what the parties refer to as a hold up effect)." Defendant's motion for summary judgment of invalidity for indefiniteness was granted. "Although this case does not involve ambiguity in the traditional sense, it is clear that a claim can be found invalid for indefiniteness when the claims teach something inconsistent with the specification. . . . [In this case] The 'guiding means' structure is found in the specification, but in the claim it attempts to do something . . . that is inconsistent with how the guiding means is defined. In short, an entire component of the guiding means cannot do what the claim says it does." Where plaintiff's damages expert's determination of a baseline royalty rate was rejected, his analysis of the Georgia Pacific factors was also rejected. "Since his baseline was little more than conjecture, it matters little how [the expert] wielded the remaining Georgia Pacific factors in asserting that they resulted in upward or downward 'pressure' on his initial postulate -- plus or minus a guess, is, after all, still a guess." ... Because Damages Provided an Adequate Remedy and an Injunction Could Have "Potentially Devastating Public Health Consequences"
Plaintiffs' motion for a permanent injunction precluding the sale of infringing vascular graft products was denied. "Certainly, money damages are not the perfect remedy for Plaintiffs; there is no remedy available at either law or equity that can rewrite the history of [defendant's] objectively reckless and wilful conduct towards [plaintiff] over these past thirty years. Perfection, however, is not the Court’s goal with respect to damages, adequacy is. The Court is satisfied that a fair and full amount of compensatory money damages, when combined with a progressive compulsory license, will adequately compensate Plaintiffs’ injuries, such that the harsh and extraordinary remedy of injunction -- with its potentially devastating public health consequences -- can be avoided." Defendant's post-trial motion for judgment as a matter of law of no joint infringement was granted. "[Another defendant] accused [the moving defendant] of breach of fiduciary duty because [the other defendant] believed that [moving defendant] owed it a duty of loyalty and candor. [Plaintiff] argues this was evidence the jury could rely on to find more than a mere arms-length transaction between the parties. However, this is not evidence of any actual direction or control. The fact that [the other defendant] at one time had a claim against [this defendant] for what it thought was a breach of some fiduciary duty is not sufficient to show that there was one." Where an ANDA specification does not "directly address the issue of infringement," the court, in determining infringement of such ANDA under the Hatch-Waxman Act, is not limited to the "the ANDA process and compounds . . . to the exclusion of the reality of the contemplated ANDA product‘s use." Rather, "the Court must look to the whole of the product, which means considering its ultimate useable state, as well as the ANDA-contemplated process and compound." The court denied defendant's motion for judgment on the pleadings that the asserted method claims were invalid in light of In re Bilski, 545 F.3d 943 (Fed. Cir. 2008) for failure to claim patentable subject matter under 35 U.S.C. § 101. "[Defendant] argues that the claimed methods do not satisfy the 'machine' portion of the test because they can be performed entirely within the human mind, or using pencil and paper. Further, [defendant] argues the claimed methods do not satisfy the 'transformation' portion of the test because they do not transform any article into a different state or thing. The court’s interpretation of Bilski is not so broad as [defendant's]. In fact, the [Federal] Circuit 'decline[d] to adopt a broad exclusion over software or any other such category of subject matter beyond the exclusion of claims drawn to fundamental principles.' "
The court determined that sanctions were appropriate for defendant's spoliation, in part because defendant's document retention policy allowed "operations-level employees" to determine defendant's data retention needs. "A court -- and more importantly, a litigant -- is not required to simply accept whatever information management practices a party may have. A practice may be unreasonable, given responsibilities to third parties. While a party may design its information management practices to suit its business purposes, one of those business purposes must be accountability to third parties. . . . [Here, defendant's] practices invite the abuse of rights of others, because the practices tend toward loss of data. The practices place operations-level employees in the position of deciding what information is relevant to the enterprise and its data retention needs. [Defendant] alone bears responsibility for the absence of evidence it would be expected to possess. . . . [I]t is clear that [defendant's] lack of a retention policy and irresponsible data retention practices are responsible for the loss of significant data." Phillip M. Adams & Associates, L.L.C. v. Lenovo International, 1-05-cv-00064 (UTD March 30, 2009, Memorandum Decision). The court denied Defendant's motion to strike the declaration of plaintiff's expert, an English Professor, on "the proper function of a comma." "[The expert] is qualified to testify as to the function of a comma in English grammar . . . To the extent Defendant argues that [the expert's] opinion contradicts the intrinsic evidence or that [she] does not have expertise in the specific technical area of the [patent-in-suit], the Court finds that these issues merely impact the weight that should be given to [her] opinion."